• All-steel construction (Black, Brass, Bronze). • All stainless steel construction (Stainless Steel). • Powdercoated finish provides durability and heat resistance (Black, Brass, Bronze). • Strong 19 gauge wire woven into 1/4" interlocking spiral panels. • Helps to prevent sparks from damaging your carpet or hearth. • Made in the USA by expert wire craftsmen. ☑ All replacement screen sets include (2) 24" wide panels to fit a fireplace opening up to 48" wide. ☑ Screen height does not include the height of the hanging rings. The included hanging rings add 1/2" to the height of the screen. ☑ Replacing an existing screen: Measure the height and width of the existing screen (not including the hanger rings) and order the same height screen. ☑ Adding a screen to an existing rod: Measure the height of your fireplace opening and subtract 1-inch. (1/2" for ring height + 1/2" for bottom clearance). ☑ Purchasing screen with an adjustable rod & valance kit: Measure the height of your fireplace opening and subtract 2-inches. • 365 Day Quality Guarantee. • 365 Day Complete Satisfaction Guarantee. • 365 Day Exchange or Return for a full refund. SAFETY: Keep the fire inside your fireplace. The high quality mesh curtains help prevent sparks from damaging your carpet or hearth. BEAUTY: Add the finishing touch to your home decor with a beautiful Midwest Hearth fireplace screen. An elegant weave and designer finish complete your custom look. 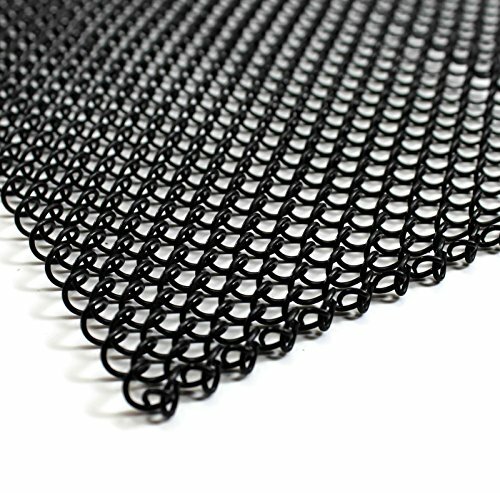 HEAVY DUTY: Strong 19 gauge wire woven into 1/4" interlocking spiral panels. Woven by wire craftsman in the USA. MAXIMUM CORROSION PROTECTION: Zinc phosphate undercoating for maximum corrosion protection and paint adherence. TWO (2) PANELS INCLUDED: Each panel is 24" inches wide and includes rings and matching screen pulls. Hanging rod and valance sold separately. If you have any questions about this product by Midwest Hearth, contact us by completing and submitting the form below. If you are looking for a specif part number, please include it with your message. Fireplace Mesh Screen Curtain. 27" High (9-27). Includes 2 Panels, each 24" Wide. Cool Grip Matte Black Screen Pulls Included.